SM2RAIN is an innovative system for the estimation of the rainfall, based on measurements of the soil water content. SM2RAIN considers the soil as a natural rain gauge, and by measuring temporal variations of the soil water content, it estimates the rainfall falling on the soil, adopting a “bottom up” approach. 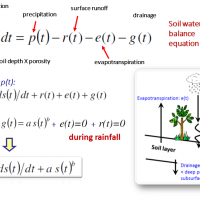 Technically, SM2RAIN relies on the inversion of the soil water balance equation that computes the repartition of rainfall in infiltration, evapotranspiration, and runoff. 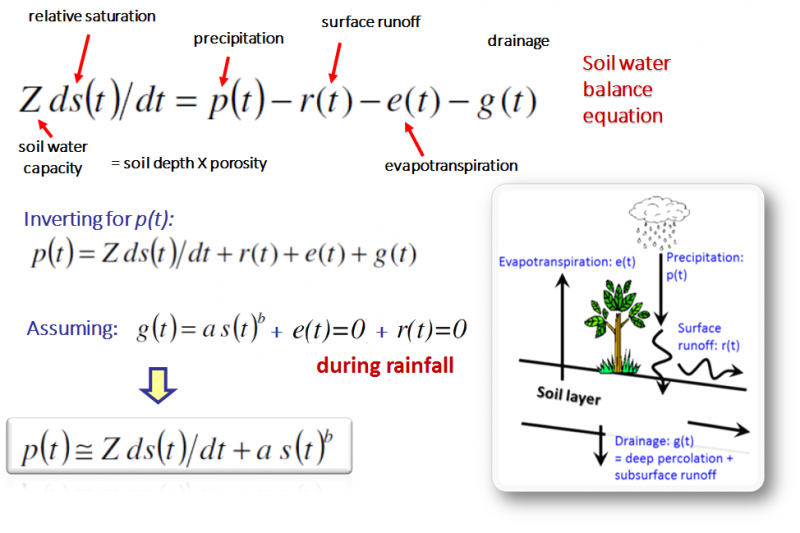 The analytical inversion of the equation allows obtaining a simple and effective method for rainfall estimation. 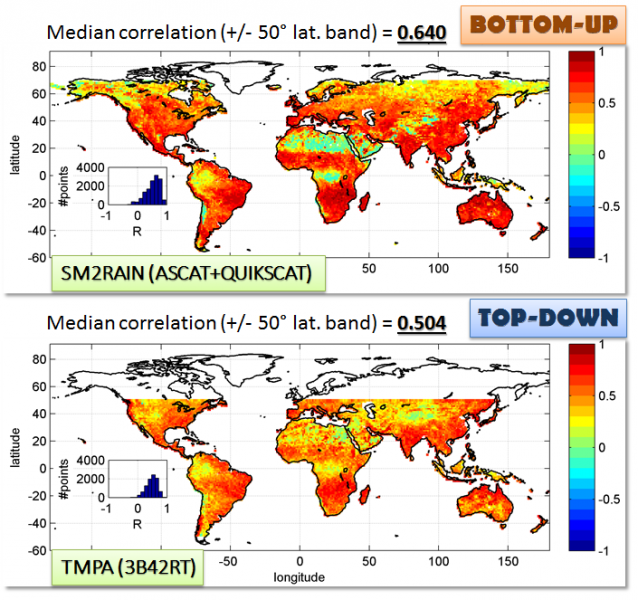 SM2RAIN can be applied to data taken by different satellite sensors (e.g., ASCAT, SMOS, SMAP, AMSR2), with the advantage of obtaining rainfall estimates in areas where ground observations are not available. 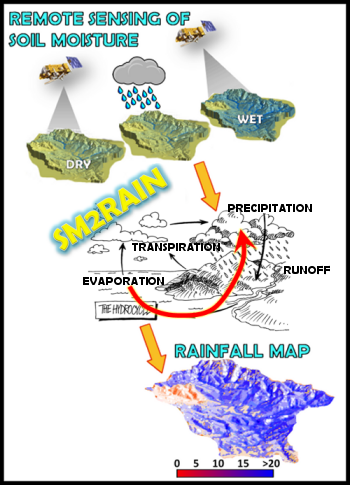 SM2RAIN has multiple potential applications in hydrology, meteorology, geomorphology and agriculture. In cooperation with Italian and foreign scientists, we have started four new research projects funded by the European Space Agency (ESA), EUMETSAT, NASA, and by the Italian civil protection system (the National Department for Civil Protection and the Regional Department of Civil Protection in Umbria). The scope of the projects is to test SM2RAIN with different sensors and for different applications. 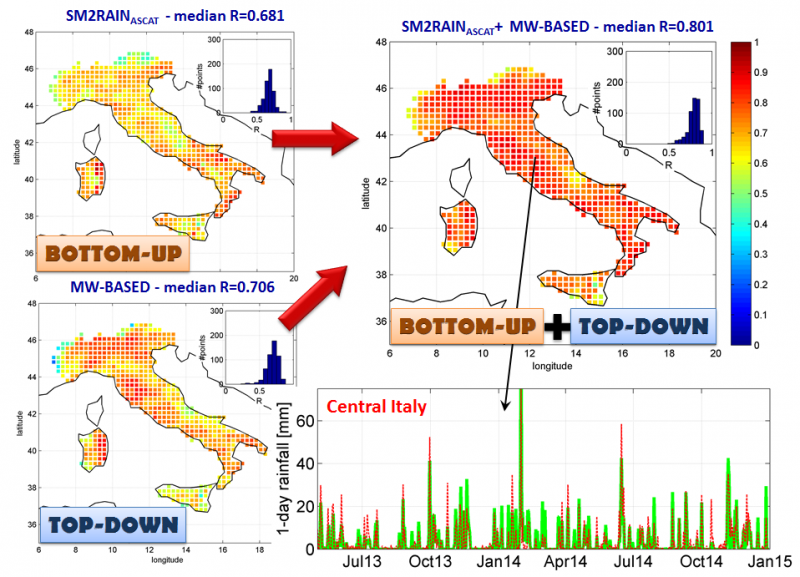 In the Institute, we use SM2RAIN for prediction of extreme hydrological events, including floods and landslides, a problem of great interest in Italy. The global rainfall dataset obtained applying SM2RAIN to satellite data, and a computer code with a Matlab® implementation of the SM2RAIN algorithm, are freely available (see website) for testing and further applications. 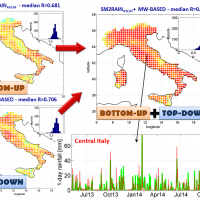 Since it was the first published in the Geophysical Research Letters, in 2013, the SM2RAIN algorithm was tested using satellite (at the global and regional scales) and ground based (in Europe and Italy) soil moisture observations and data. 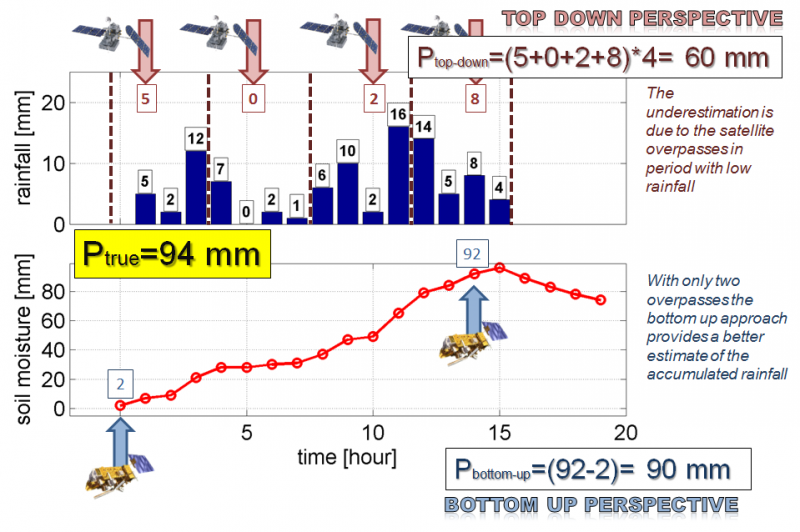 Use of a bottom up approach for rainfall estimation proved very reliable, with results more accurate than those obtained from consolidated remote sensing techniques based on a top down approach (see the gallery of pictures below). 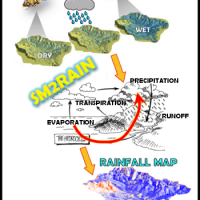 Integration of bottom up (SM2RAIN) and top down (state-of-art) approaches resulted in significant improvements. 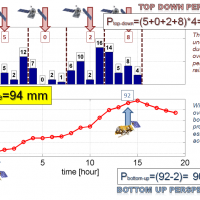 In Italy, the median correlation between observed (on the ground) and estimated (from space) rainfall was 0.80, on a daily time scale. Combining ground rainfall measurements and SM2RAIN-derived rainfall estimates, we obtained significant improvements in flood and landslide modelling and prediction. Space Agency: EUMETSAT, ESA, NASA. Civil Protection: National Department of Civil Protection (DPC), Umbria Region Functional Centre. Brocca L, Ciabatta L, Massari C, Moramarco T, Hahn S, Hasenauer S, Kidd R, Dorigo W, Wagner W, Levizzani V. 2014. 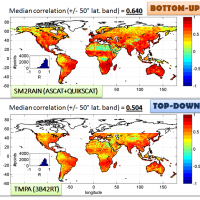 Soil as a natural rain gauge: estimating global rainfall from satellite soil moisture data. Journal of Geophysical Research 119(9), 5128-5141. DOI: 10.1002/2014JD021489. Nature Research Highlights: Detecting rainfall from the bottom up. Nature 509, 262–263. DOI: 10.1038/509262e.